Guralp digitisers and digital instruments can be supplied with external triggering capabilities installed. The external trigger system is designed for maximum flexibility: you can trigger other digitisers or your own equipment using built-in relays and any equipment may be used as a trigger source, using the built-in opto-isolator. 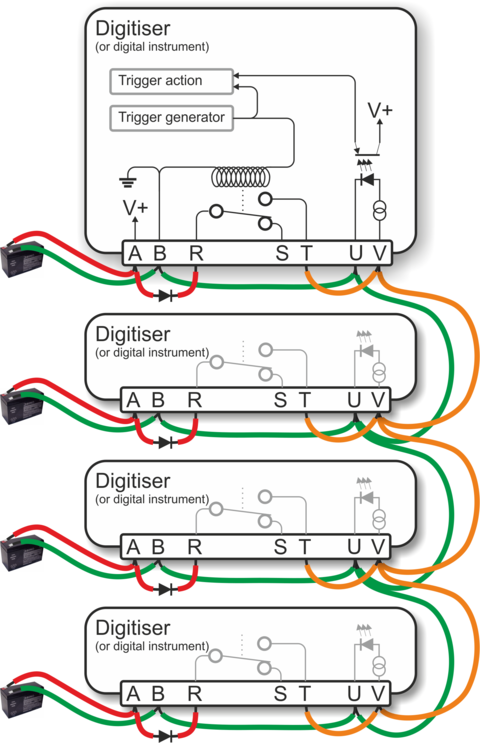 In addition, a trigger circuit can link together any number of digitisers so that they trigger simultaneously when they receive a signal. 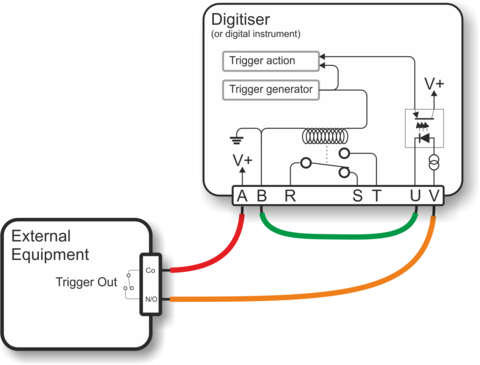 The digitiser or digital instrument has two internal components related to triggering: the trigger generator and the trigger receiver. The trigger generator runs the triggering algorithm and determines whether a trigger has occurred. If external trigger output has been enabled, the trigger generator also operates a relay which disconnects the Trigger Out Common pin (on the POWER/DATA/GPS port) from the Trigger Out Normally Closed pin and connects it to the Trigger Out Normally Open pin. See Error: Reference source not found on page Error: Reference source not found for connector details. The relay is only activated whilst the generator is active. This does not include any pre-trigger or post-trigger period, which is dealt with by the trigger receiver. A trigger signal may be as short as one second. The trigger receiver acts upon trigger signals: normally, by recording or transmitting additional data streams. The receiver will always enable these extra streams if the trigger generator determines that a trigger has occurred. If the external trigger input has been enabled, the receiver will also act on a logic signal received on the Trigger In pin of the POWER/DATA/GPS port. Any signal between +3 and +40 V can be used – the trigger input pins drive an opto-isolator protected by a constant-current circuit. The Trigger Out relay is notactivated if you provide a Trigger In voltage. The digitiser must trigger itself for the relay to switch. This arrangement prevents any trigger loops from occurring. The diagrams on this and the following pages show the additional connections you will need to make. Pins not illustrated should be connected to your power and data systems as normal. If your equipment can trigger from the same voltage as the digister’s power supply, the simplest arrangement is to use the voltage across the sensor’s power supply as the trigger supply. Connect the ground pin (B) to your equipment’s trigger return line. If your equipment does not have a separate trigger return line, consult its documentation for how to apply trigger voltages. (The diagram above does not show the power supply to either the sensor or the triggered equipment: only the triggering system is shown). Because a trigger signal may last for only a short time, using pins T and B directly to power your external equipment is not normally advisable. Ideally, the equipment should be continuously powered and listening on dedicated trigger input lines. If this is not possible, it may be enough to build a control circuit with a time-out period, which supplies your equipment with power for a suitable minimum length of time whenever a trigger is activated. The digitiser cannot anticipate a trigger. Pre-trigger recording is achieved using a continuously-updated ring-buffer of the most recent data. Any external equipment must have its own buffering capabilities if you need pre-trigger data. Connect pin A to pin R, and pin T to your equipment’s trigger signal input. Connect the remaining pins as normal. If your equipment needs a different voltage, you will need to provide a separate voltage source for the triggering system. The diagram above illustrates how to trigger the external equipment using its own power supply, which is connected to the trigger input via the normally-open relay contacts (pins R and T). In this configuration, the two power supplies are completely electrically isolated courtesy of the relay. It is normal practice, though not essential, to connect the two power supply negative terminals to a common earth point. 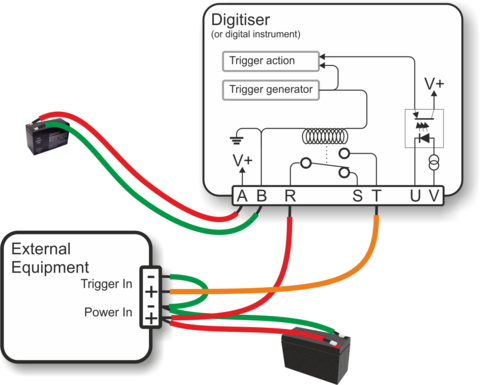 To trigger a digitiser from an external source which provides a triggering voltage, you merely need to connect the external trigger voltage to pins U and V of the digitiser as shown above. The voltage can be anywhere between 4 and 40 V DC as the constant current circuit protects the LED of the optoisolator. Connect the common pin of the relay to the positive supply on pin A.
Connect the normally open pin of the relay to the positive trigger input on pin V.
Connect the trigger input return (pin U) to the negative supply on pin B.
Connect the other pins as normal. A common use of the external triggering feature is to ensure that all digitisers in an array trigger at the same time. This can be achieved with the wiring layout described in this section. 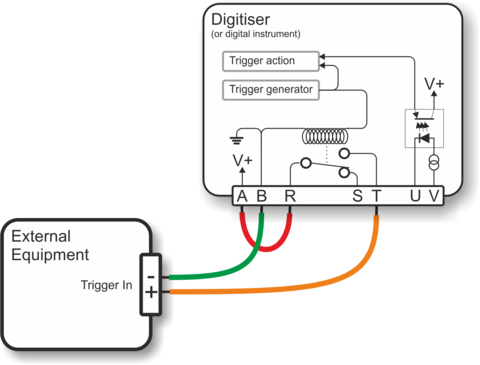 With this arrangement, any digitiser can generate a trigger, which will be passed on to all the digitisers in the array. The remaining data pins are connected to your recording equipment as normal. The diode between pins A and R is important, because if two digitisers generate a trigger simultaneously, their power supplies will both be connected via the internal relay contacts to the common trigger line on pins V, and hence connected together. This can cause considerable current flow with consequent risk of fire, as well as severe damage to equipment and cables. In the case where a single power supply is used to power all of the equipment, this is not an issue and pin A should be connected directly to pin R on all units. The more common case, where each unit has it’s own power supply, is shown above. Please note that all the power supply’s ground terminals will be connected together: they must, therefore, have floating outputs or grounded negative terminals. The trigger inputs of a DM24 digitiser are slightly different to those on a CD24: the return pin on the DMG-DM24 is connected internally to the power supply ground (it is isolated on the CD24). Note: While CD24s support external triggering in a similar fashion, the exact details vary. If you are planning an installation involving both DM24s and CD24s, please consult GSL support for advice. UPLOAD the new configuration to the digitiser. 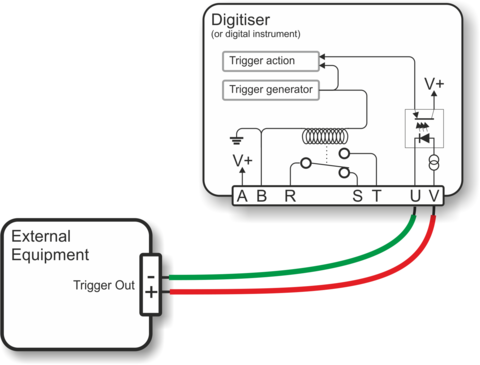 If a digitiser has both Enable External Trigger Output and Enable External Trigger Input selected, it will record data when it receives an external trigger as if it had triggered itself, but it will not relay the trigger on to other digitisers. It will only send a trigger message if its own triggering criteria are satisfied. This prevents triggering loops.